There are few cars as American as the Corvette. Designed in the triumphant years following World War Two by a Belgian-Russian immigrant for a car company founded by a Swiss-French immigrant, the Corvette proved this country could build a sports car to compete with the best of the Old World while retaining a distinctly American V-8 roar. If it weren't for a law prohibiting the Stars-and-Stripes from being used in product branding, the very logo of the Corvette would be an American flag. Today, 60 years after the first Corvette rolled off the assembly line, it is an icon that transcends economic, social, and racial barriers. From Texas to New York to Los Angeles, a Corvette is a status symbol, an aspiration, and a representation of what it means to make it in the land of dreams. Happy Fourth of July! The 97th running of the Indianapolis 500 is only a few days away, so this seems like a good time to take a cinematic look back at the early years of the world's most famous auto race. The Big Wheel is a feature film from 1949, telling the story of young racer Billy Coy (Mickey Rooney) and his journey to The Brickyard. I first saw this film on late-night PBS over a decade ago. I remembered only a few snippets of dialog, but that was enough to set me on the trail that led to the full-length, public domain download hosted here on the Internet Archive. 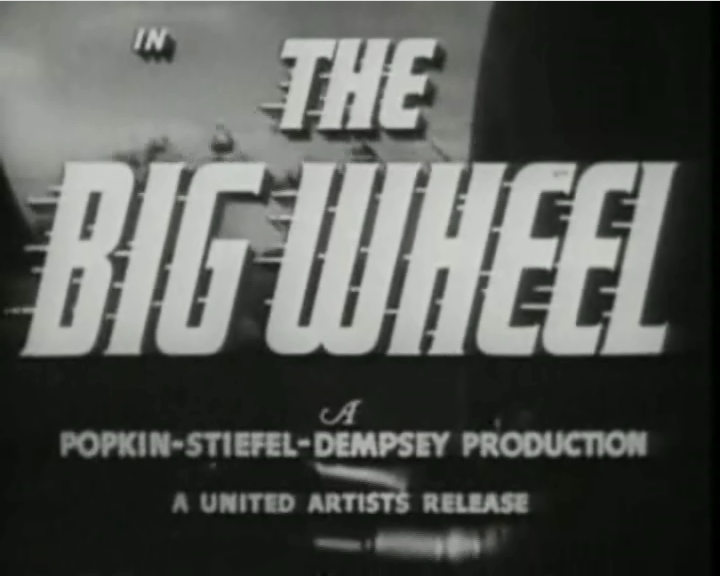 The Big Wheel carries many of the tropes of the era, including a brassy soundtrack, dialog that feels more like Broadway than real life, a slick-haired villain, and one (blessedly short) stereotypical depiction of an ethnic minority. It seems the director, like almost all of his contemporaries, was also unable to resist the urge to include a musical number. The aforementioned are more zeitgeist than shortcomings, though, and the film tells a good story. It even pulls off a particularly heart-wrenching accident scene with limited special effects. The real joy of watching The Big Wheel in 2013, and my reason for this post, is the great vintage racing footage. Most of the racing footage in the film is from actual period events, including the Indy 500. The film even opens with a ride-along view, which must have come from a suitcase-sized 1940s GoPro. There is no shortage of vintage racing machinery due to numerous garage scenes, and there's a fair bit of history, too. This film depicts an Indy 500 very different from the one running this weekend, when grassroots racers on razor-thin budgets were still experimenting with all manner of configurations to find the winning set up. Even though the cars of 1949 barely crack half the speed of current qualifiers, they look even more exciting as they slide around the turns with no safety equipment worth mentioning. The racing in this film is real, and for that, it's better than any modern CGI. The Big Wheel can be downloaded in many popular formats here. This 1953 Chevy is definitely the oldest and cleanest City Survivor Urban Gear Works has featured to date. 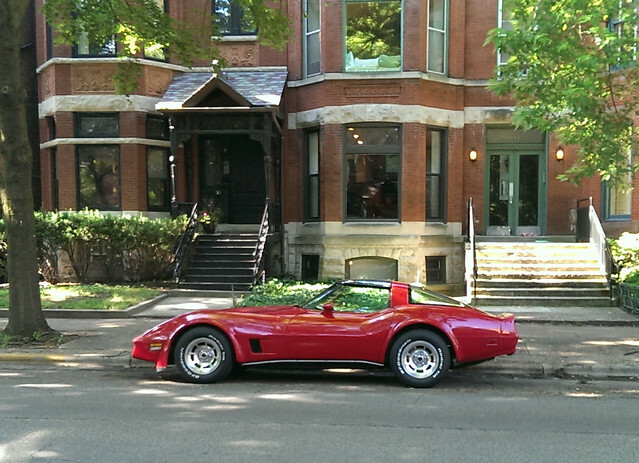 I was so surprised to see a car of this vintage parked in the middle of the Loop (at this time of year, no less!) that I got off the bus and suspended my commute home for a closer look. As I drew nearer, I realized that the Chevy was quietly idling, and the owner, who identified himself as Jeremiah, was sitting inside. The chance to interview the owner of a feature doesn't happen very often, so I was glad for the opportunity to learn a little more about this example. As I suspected from the distinctive, but subdued, exhaust note, this Chevy still retains the original "stovebolt" inline six-cylinder engine. 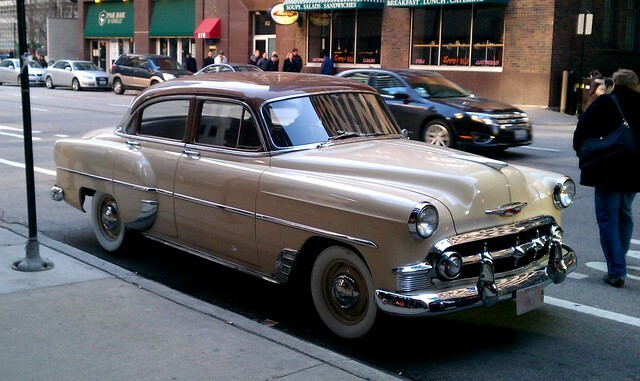 The two-tone brown exterior is fresh, and likely better than it would have been in 1953. During our conversation, the owner pointed out the interior, which he is still in the process of restoring. I have to give a lot of respect to Jeremiah for his restoration - I didn't want to pry to much into a stranger's life, but if I had to guess, there's a good chance his parents weren't even born yet when this car rolled off the assembly line. The choice to do a factory-style restoration of this 1953 sedan (versus the much more frequently seen '55-'57 Bel-Air) demonstrates a commitment to the craft and the hobby. This car doesn't sport the flamboyant chrome seen on later 50's models, and the color scheme is much more subtle than the iconic fire-engine red often chosen, but sheer anachronism of this car streetside was enough to stop pedestrians in their tracks on a Friday evening. For readers who haven't experienced it, it takes quite a lot to get the attention of anyone who commutes in an out of the Loop daily. Stimuli of every sense are so prevalent that a sort of voluntary numbness is almost required. Just in the time that I was talking to the owner, however, at least three other people stopped to take pictures. There was something unique about seeing this car parked downtown. Unfortunately, my picture only shows a backdrop of nondescript offices, but behind me stood a line of century-old brick three-stories. This new-looking 60-year-old car made the whole street look like it was from another time - it was easy to picture the entire sight being part of an old detective movie, complete with three-piece suits, fedoras, and guys named "Lefty". Urban Gear Works wishes the owner all the best in his continued restoration efforts! 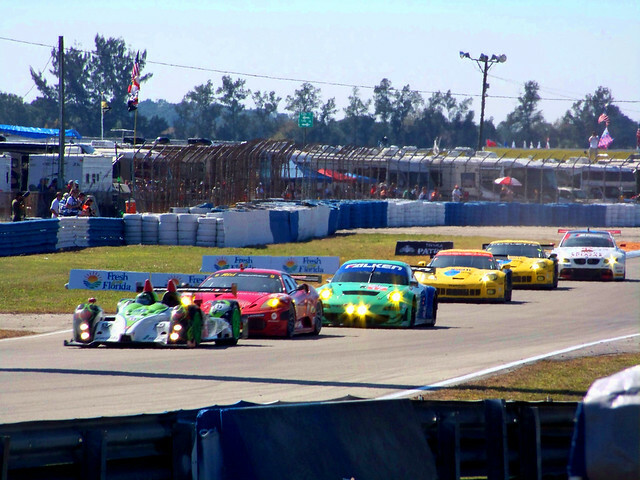 It's 12 Hours of Sebring Time! Hey, Urban Gear Works readers! Do you, like me, just not care about college basketball? Is the dreary weather throwing a blanket over your St. Patrick's day? Have hope, it's time for the 12 Hours of Sebring! This is some of the closest-to-factory racing you can find, with Porsche, Ferrari, BMW, Chevrolet and Dodge slugging it out in cars that have way more ties to the showroom than anything you'll find on an oval track. In this 61st running, the automakers just listed, plus the LeMans prototypes, compete in a 12-hour endurance race under the Florida sun that is just as much about durability as it is speed. The race runs until sometime around midnight Chicago time, and most of it is being broadcast live on Fox Sports SPEED. Supposedly, the race is also streaming online, but details are elusive. In the last City Survivor post, I referenced the Wikipedia article for the Pontiac Banshee. In doing so, I found that there was no public domain photo of the car, and Wikipedia's article was less meaningful because of it. References were made to the radical styling and its impact on later GM products, but without any illustration, the car's appearance was left to the imagination of the reader. This got me thinking. I have some old 3x5 photographs of the Banshee that I took at the Trans Am Nationals, probably fifteen years ago. They aren't museum quality, but they're clear and the color is true. It's not like anyone would ever pay for the rights to these photos, but they accurately represent what the Banshee looks like. So, the other night, I pulled the scanner out of its drawer, scanned the photographs at the best resolution I could, and uploaded them to Wikimedia Commons. What's the point? The point is that now the Banshee article contains a picture to match the subject. I place this test before the Urban Gear Works readers: type the name of your favorite car into Google, and see if there isn't a Wikipedia article in the first five results. Google is the dominant search provider of the English-speaking world, and with Wikipedia articles ranking so high in the search results, there's a very strong chance that someone who wants to learn about a car will wind up there. Because Wikipedia is crowdsourced and not for profit, the public is responsible for images as well as textual content. I've been going to car shows and race tracks my entire life, and every time, there are droves of amateur photographers taking hundreds photographs of every car. In my personal experience, I almost never shared those pictures with anyone until I started this site - it's rare to find another individual who's interested. No one is ever going to pay me royalties for a 35mm point-and-shoot photograph, either. It seems very unlikely that I'm alone in this. That's why I'm asking Urban Gear Works readers to do what I just did: release some of your old photos to Wikimedia, and share that little bit of your automotive knowledge with the whole world. There's nothing to lose, but the whole hobby benefits. 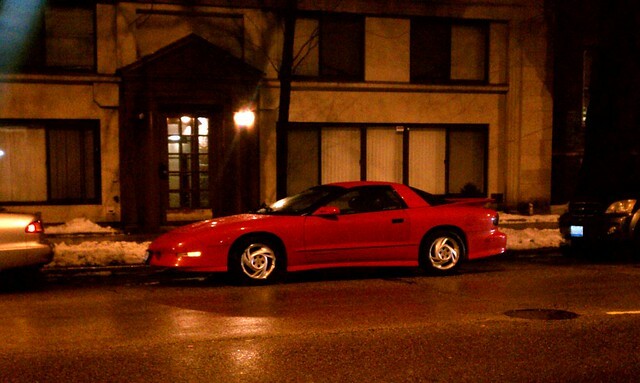 I found this Trans Am on my way to dinner tonight. At first, I thought it was too new for a City Survivor, but after a moment of consideration, I realized that actually I'm just getting old. The unique and decidedly early-Nineties Pontiac wheel design marks this as a very early fourth-generation F-body. The fourth (and final) generation of the Pontiac Firebird launched in 1993, so this car has faced two decades on the road, and looks remarkably clean for it. By the time production ceased in 2002, the Camaro and Firebird were subject to much criticism for their solid-axle handling and dated design, and sales were hampered by the fact that prices had risen to the point that they were all but unattainable to their target market. In 1993, though, this car was a big deal. Ford's Mustang was still carrying a design from the late Seventies. The Firebird had just endured a decade of fuel economy and emission restrictions that (with a few notable exceptions) left it a mere shadow of the monstrous Ram Air and Super Duty models of the pony car wars. 1993 saw a return to serious performance with the introduction of the LT1 V-8 and a sleek body drawing heavily from the Banshee showcar. Though the LT-1's 275 horsepower seems mild in light of the current V-6 Camaro's 300-plus, it put the Trans Am back in the same league as the earlier (and heavier) 290 horsepower Super Duty. 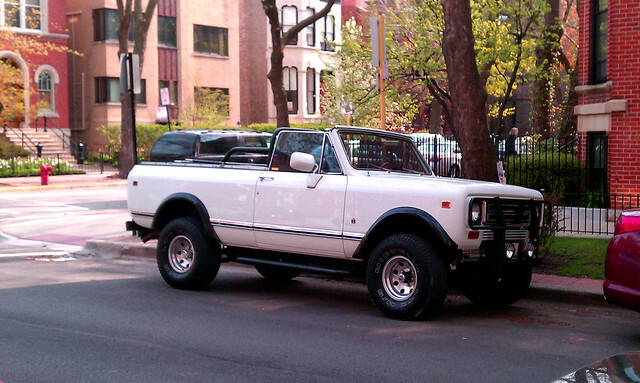 Given the generally high production volume of these cars, it is surprisingly unusual to see an original example. I think it will still be a few years before these cars achieve true classic status, but so many of them have been abused that it's refreshing to see one that hasn't fallen apart from neglect, been hacked and mutilated with a slew of poorly executed modifications, or had its ground effects torn off by a high curb. Before Christmas, both the Juke Nismo and Juke-R made the Urban Gear Works wish list. This past week, Nissan announced that the Juke Nismo is coming stateside. According to Nissan's website, the high-performing Juke should be available sometime in March. Like most recent Nismo (Nissan Motorsport) models, the Juke's enhancements focus more on handling than outright speed. While there is a 9 horsepower bump, paired with 7 pound-feet of torque, for a total of 197 horsepower and 184 pound-feet, Nissan also claims that efficiency and emissions are not compromised. These aren't the monster numbers of the Juke-R, but in a car as small as the Juke, it should be enough for a spirited driving experience. It also bodes well for the everyday usability of the Juke that fuel economy is preserved. The Juke has never been known as a good looking car, but like a bulldog, a hairless cat, or bagpipe music, it bends so far to the unusual that many find it endearing. 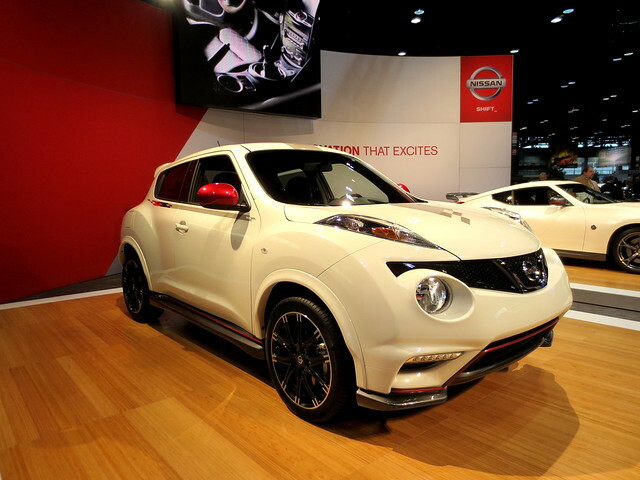 Nismo has made many subtle changes to the outward appearance of the Juke. The lower vents in the front fascia are functional on AWD models, and the overall package is said to increase downforce by over 30 percent. Additionally, the Juke's ride height has been slightly dropped, and larger, Nismo-specific wheels have been fitted. Larger wheels and lower height can improve the appearance of almost any car, and the Juke is no exception. Finally, the interior has been enhanced for a more sporting driver experience. 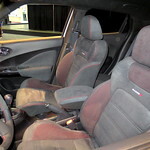 I had a chance to get a closer look at the Nismo interior at the Chicago Auto Show last Friday, and I was impressed. The suede, Nismo-exclusive seats are comfortable but very supportive, and the contrasting red stitching throughout the interior is sharp. The top-dead-center stripe on the steering wheel is a little boy-racer (really, who is going to drive it that hard?) but the red-anodized aluminum face of the tachometer is a unique element that works well. In AWD trim, the Juke Nismo is a very affordable entry on the short list of "one car for everything". It's sporty, efficient, versatile, and compact, but also affordable. This is one car Urban Gear Works would really like to take for a test drive. More pictures and details are on Nissan's website. View our flickr gallery from the Chicago Auto Show. Last Friday, Urban Gear Works had the opportunity to attend the Chicago Auto Show's Social Media Preview. I can't stress enough just how amazing it was. The people in charge of running the Chicago Auto Show should be genuinely proud of the event, and they deserve further accolades for opening their preview up to members of the non-traditional media. As I've stated before, I started Urban Gear Works as much to sharpen my skills as a software engineer (my "day job") as I did to create an outlet for my automotive passions. In the process, I've come to understand some of the difficulties a small blog faces when operating along side more established sites and traditional media outlets. It was very forward-thinking of the Chicago Auto Show to recognize the efforts of grassroots blogs like this one. Not only did I learn how exciting it can be to cover a media preview, I learned just how much work it can be. Obviously, the event was on Friday, and now it's Monday. I have new found respect for full-time journalists after single-handedly attending as many events as possible, retouching hundreds of photos, and working up a set of articles. I've been attending the public auto show for decades, but it is a completely different experience to attempt to cover every scheduled event and photograph all the new models. I honestly had no idea just how much work was involved. Ralph Gilles (@RalphGilles) and Klause Busse (@BusseKlaus) are very genuine, friendly people. Despite their top positions at Chrysler, they were both very willing to share their time and thoughts with members of the social media. Ralph Gilles spoke to me in a way that made me feel like I wrote for Road & Track, and Klause Busse personally showed me some special details in the Viper's interior. I'll go more in depth about both soon. Last year, matte finishes were limited only to the Mercedes display, but it looks like they are now in full trend. Several automakers displayed matte-finished models, but the Fiat Abarth, Hyundai Veloster Turbo, and Chrysler 300 Turbine really stood out. Since I've moved to the city, whenever I look at the new models on offer from an automaker, I'm always considering whether any fit the elusive category of "one vehicle to do everything". It has to be small, stylish, sporty and versatile. Many cars make three out of four, but finding a car that checks all the boxes is very difficult. The Buick Encore, Nissan Juke Nismo, and Fiat 500L are all interesting additions to this category. In all the years I've been attending the auto show, I've always wondered if any of the public's comments make it back to the manufacturers. Attending the less-crowded media preview gave me the opportunity to find out. Some of the people working the displays aren't just models hired for the event. Some are actually employed by the manufacturers, tasked with writing reports back to management. So, next time one asks you if you need anything, it might be worth asking when that concept car you fell in love with is going into production. Urban Gear Works will be reporting more on all of the above in the near future. Until then, enjoy the flickr gallery! There is less than a week to wait for the 2013 Chicago Auto Show! This year's show carries much cause for anticipation; Detroit has already given us a preview of the big stars, like the Corvette Stingray and Cadillac ELR. Urban Gear Works is obviously looking forward to the new Jeep Grand Cherokee, but we're also hoping to spend some time with the next generation Volkswagen Golf, the Dodge Dart, and the Porsche Cayenne, among others.